Whether you lift weights, play badminton, enjoy the outdoors, love to volunteer, or want to learn a new language, you'll find a supportive and fun community within all our programs, clubs, classes and facilities. With the Red Sea on its doorstep and ample recreational amenities, KAUST offers a wide range of activities and opportunities to all eligible faculty, researchers, students, staff and family members for keeping fit, active and entertained. The Island Recreation Center is a recreational facility created for you and your family. Imagine belonging to a sports club where every member of your family can immerse themselves in activities with maximum appeal. Moms can train in the female fitness studio, while dad enjoys a game of tennis, and the kids are at the pool… and then the whole family can gather together afterward to enjoy family fun-time in the ocean view pool overlooking the Red Sea or have a family meal and watch the sunset at Pure restaurant. 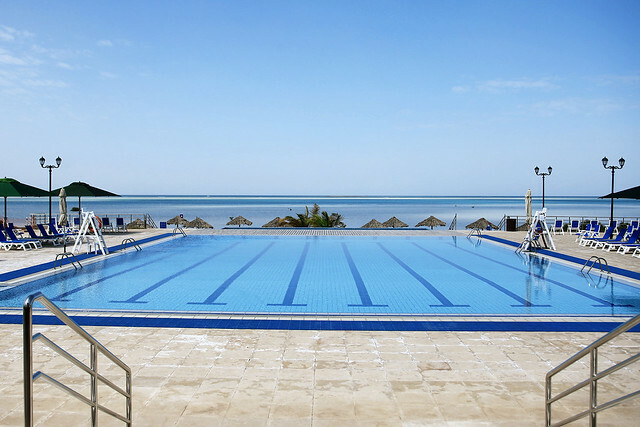 Set in the heart of the Island District overlooking the turquoise waters of the Red Sea, the Island Recreation Center offers a wide variety of 'Get Active' recreation activities for residents. The Harbor Sports Club features a variety of indoor and outdoor recreation facilities including a sixteen-lane bowling alley, multi-purpose sports hall, fitness rooms, group exercise rooms, family swimming pool, ladies' swimming pool, kids' pool; squash courts, meeting rooms, café, billiards, table tennis, an athletic track, and a soccer field. All swimming pools have lifeguards on duty and the fitness rooms are staffed by professionally-trained instructors. Located in the Gardens district, the Racquet Club offers residents a facility to improve, enjoy and explore their favorite Racquet Sports. The Racquet Club provides varied and innovative programs in tennis, squash, racquetball, badminton and also provides a dedicated gymnastics area for the fast-growing Gymnastics Club. Located just beyond South Beach in a sheltered bay, the center is equipped with its own training pool, dedicated classrooms, scuba diving retail shop and shower facilities. Here you will be able to take the full range of PADI scuba diving courses, from Open Water all the way up to Dive Master, including first aid and CPR. RYA powerboat courses (Level 2) are also offered. Located on the picturesque KAUST Marina, across from the Beacon, Al-Marsa Club offers a full variety of facilities and services including scheduled and private chartered boat cruises, snorkeling and diving trips, and traditional fishing trips; a fine dining restaurant; conference rooms; and event and catering services. The relaxed atmosphere, combined with fine dining ambiance, makes it a popular destination. In addition, Al-Marsa is an ideal venue for a variety of catered events. The Marine Services Guest Care Office is open daily, including weekends. It manages all guest inquiries and reservations for community scheduled and private chartered boat trips such as snorkeling, sunset cruises, fishing and scuba diving. With numerous beautifully landscaped parks, playgrounds, football and cricket fields located throughout the KAUST community, residents have the many opportunities to enjoy outdoor recreational activities, including jogging, walking, and playing games. Community members also benefit from cycling and walking paths in Safaa Island Park and the Safaa Gardens neighborhood. There are also jogging tracks, water features and access to several football, cricket and other sports fields in the Islands and Gardens neighborhoods. A 9-hole, par 36 golf course is available to the residents of the KAUST community. It is beautifully maintained and, in addition to golf, it is home to over 175 different species of birds, both indigenous and migratory. The Golf Academy is one of the finest in the Kingdom; with full-time PGA qualified professionals available for group and individual lessons. Junior golfers are particularly encouraged. The clubhouse has a restaurant overlooking the greens, a golf teaching room, a pro shop, a golf driving range, and a golf cart store. Our community develops and runs it's own special interest groups, clubs and associations. Currently, there are a number of active Community Clubs, including Dragon Boat, Photography, the Art Group (including pottery and crafts) Red Sea Cycling, Boy and Girl Scouts, Young Builders, Red Sea Rugby, Ultimate Frisbee Group. Community Clubs encourage, promote and sponsor recreational and educational activities, special events and entertainment programs for the benefit of its members and the KAUST community. Located near the Golf Course a 5,000-seater stadium is available for large events, ceremonies and football tournaments. The stadium has hospitality areas and its own media center for televised events. Set near the picturesque Harbor, the Library is a great place to relax with a good book while enjoying the harbor and sea view. The library is open to all community members and caters to all ages, offering books, DVDs, CDs, audio books, journals, magazines and newspapers in English, Tagalog and Arabic. Two seminar rooms are available on the ground floor for meetings and training.